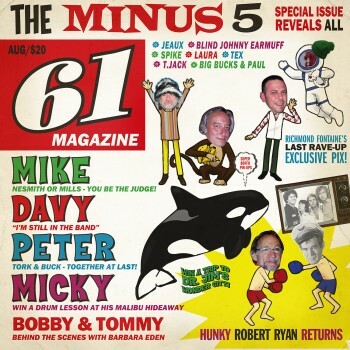 The Minus 5, the folk/rock/pop collective captained by Scotty McCaughey, announce their latest release, Of Monkees and Men, out August 19 on Yep Roc Records. An imaginative tribute to the Monkees’ legacy in music and popular culture, the album was previously only available in a five-LP, limited edition 2015 Record Store Day release. The album is now available for pre-order, with an instant download of “Robert Ryan is Among Us.” Watch the performance of a few songs in the newly premiered Sawyer Sessions, and be sure to check out Scott Mccaughey talking about The Monkees. The album features nine original songs, that pay heartfelt homage to the Monkees as well as other friends and artists influential to McCaughey’s musical psyche. Side One tackles each member of the Monkees in song, starting with the ten-minute epic “Michael Nesmith,” and ending with “Boyce & Hart,” which praises the songwriting team behind many beloved Monkees hits. Side Two bows to iconic actor Robert Ryan, the brilliantly literate Portland-based Americana band Richmond Fontaine, and, in “Blue Rickenbacker” and “Weymer Never Dies,” two lost comrades that loom large in McCaughey’s development into a rock and roll lifer.